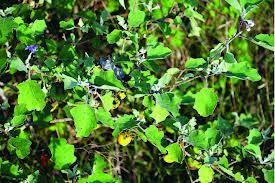 This plants usually found in black soil area having thorn on leaf and stem as well. The flower are purple and fruits are yellow and round in shape. Tooth ache, asthma, whooping cough. Put the seeds on fire for smoke that will cure tooth ache. This root, Adhatoda root, 40 gm each , long pepper 5 gm boil these items in 2 litres of water into 500 ml give 100ml.four times per day for asthma, and whopping cough.